$37.99 & FREE Shipping on orders over $59 $35. Run! The walking dead hops are here! The only thing different between this and real zombies though, is that you'll be running towards this beer, rather than running away! Malty with a huge Citra hop presence, this is our clone of the nationally known and loved Zombie Dust Pale Ale by 3 Floyds Brewing Co! This recipe falls right in line with the original featuring Munich, Crystal 60L, and Carapils malts along with fresh 2-row base malt to create a smooth malt backbone with a nice mouthfeel. The only hop in this beautiful beer is Citra, but there's a whole lot of it! 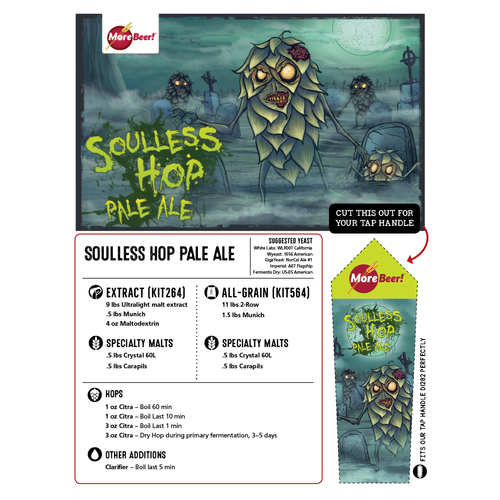 With half a pound per 5.5 gallon batch, the Soulless Hop Pale Ale is a prime example of just how amazing Citra hops truly are! 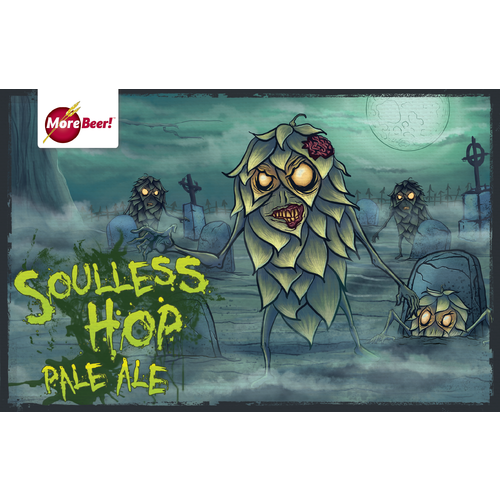 Soulless Hop Pale Ale Pint Glass - 16 oz. Brewed the extract version before. May have been the best beer I ever made. Need to make it again in all grain. Sounds good. Haven't brewed an all grain in a while. It says to dry hop during primary fermentation, but the back says after fermentation. Which is it??? BEST ANSWER: Either will produce good results. Active fermentation will interact will the hops during primary and produce different flavors (will you notice it, maybe...). I've done this kit many times and did it both ways (2 days vs 5-7 days dry hop), and did not notice significant differences. Hope this helps. I dry hopped after primary fermentation and thus gave me a more three floydsesque clone. However I have been reading lately to dry hop during primary fermentation to produce more of a New England style haze. Good luck with whatever you decide. I always dry hopped in the second stage fermenter or keg. In my opinion there is too much other activity going on in the primary. Hope this helps!! I did it during primary fermentation. Fantastic beer. Just to double check. Do these kits include hops or just grains? 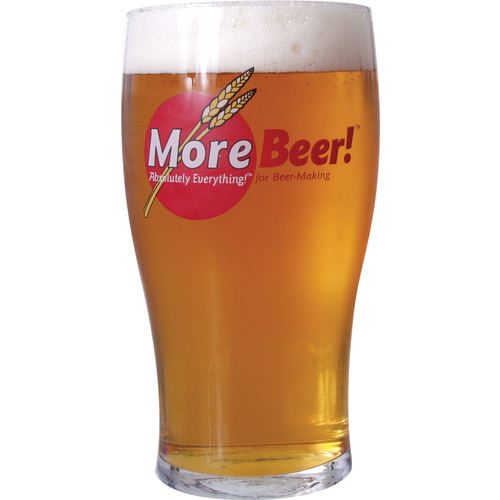 BEST ANSWER: Hi Bryan - Yes, our kits include hops designed for the recipe. I don’t see it noted, what are the recommended yeast(s)? BEST ANSWER: The recommended yeasts are California ale wlp001 for white labs and American ale wy1056 for wyeast. If you are looking for dry yeast then I would use the US-05 American ale yeast. I just bottled this yesterday but the initial taste is good. Fermentation started with 24 hours and lasted about 10 days. Mine came out at bit higher in original gravity and final alcohol content was 7.1%. I dry hopped for 5 days and bottled even though we had an island wide power outage because we have people showing up for the holidays. Excellent beer, I love Citra! Great beer I think another oz of Citra at the 10 minute mark would make it even better but I love hops. Nice hop flavor, not overpowering. Very good IPA, not overly "hoppy" for those who want a more mild IPA. I've brewed 3 batches of this and all 3 have been fantastic. I can't compare it to the real thing, I'm on the east coast and can't get the original. But the merits of this beer (close to the original or not) are well worth a try! This beer has a dedicated tap on my kegerator! second time all grain, for some reason i got a sg of 1.076 an a final of 1.012 its rocket fuel but taste great. going to get again. will get the extract version next time to compare. Very tasty pale ale that has a reddish orange color with tons of citrus flavor and aroma. I moved the first hop addition back to 25 mins to make the IBU's come in closer to 60. Considering the amount of ctira hops that come with this kit, it was also an excellent value. This beer turns out with a great citrus nose and big Citra hop bomb for a Pale Ale. Malt supports and allows for balance with the Citra to keep it off IPA status. I deviate from the recipe a bit and throw 2 ounces of Simcoe in the dry hop to give it a little more hop nose. Great go to kit for a easily drinkable Pale Ale. One could mix other hops in the dry hop or play with several different schedules to change the outcome of this kit. Highly recommend for (a close) Zombie Dust fan! Beer turned out good. Hit 63% efficiency so slightly lower. The 8 ounces of citra hops are great, but just wish there was just a little bit more different hops in it. It's a citra bomb for sure. Strong. That would be my only complaint. Throw in a floral hop to balance that citra and it would be excellent. But then it wouldn't be a clone of Zombie Dust.